The crazy hot, humid and sunny weather is terrible for our delicate skin. If you have an active lifestyle, especially one that involves the great outdoors, then you'd probably be battling the 6 common imperfections- pimples, redness, pores, shininess, dull complexion and scarring. 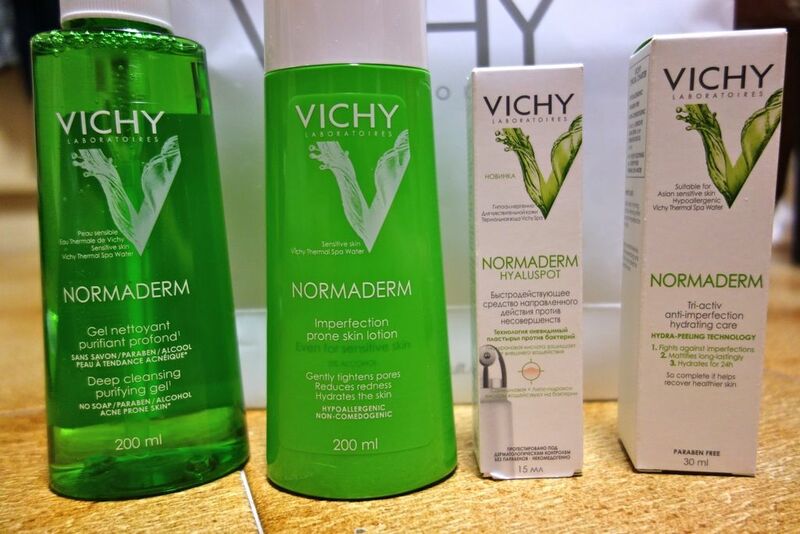 The nice folks at Vichy Laboratoires recently sent me their Normaderm care package which is formulated to treat these skin problems. Clearer skin within a week? Why not? The sweet surprise in a beautiful tin box. Here's the basic regime that you should start/maintain to get relatively problem free skin! 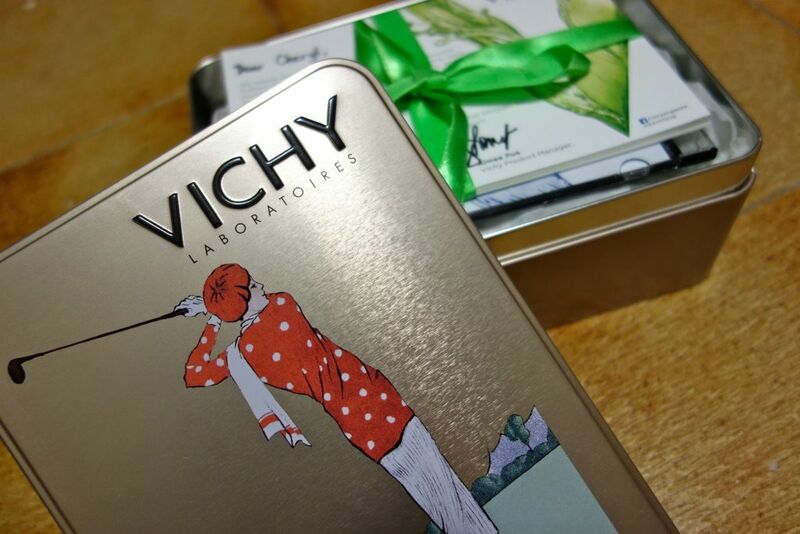 I love the light, refreshing fragrance of the Vichy products. It's a cool floral scent which reminds me a little of Marc Jacobs Daisy? The Deep Cleansing and Purifying Gel (200ml, $29) leaves the skin clear and fresh. I liked that the gel doesn't leave my skin feeling too dry or tight. There's a nice cooling sensation on my skin after using the gel. Follow it with the Normaderm Astringent Cleansing lotion to tighten the pores and give your skin a matte finish. I would think that this is a toner but it left a slightly sticky feeling which I didn't quite like. So I use my DRx toner to cleanse my skin after. Tri-Activ Anti-Imperfection Moisturizer (50ml, $39). 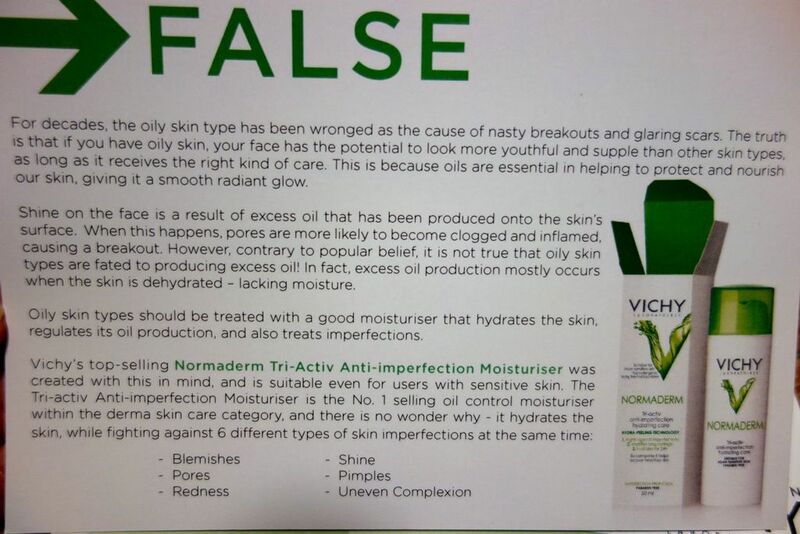 This is the no.1 selling oil control moisturiser in derma skincare. It's very lightweight and easily absorbed by the skin, leaving no greasy feeling at all. My face felt cool and refreshed after applying the moisturizer. 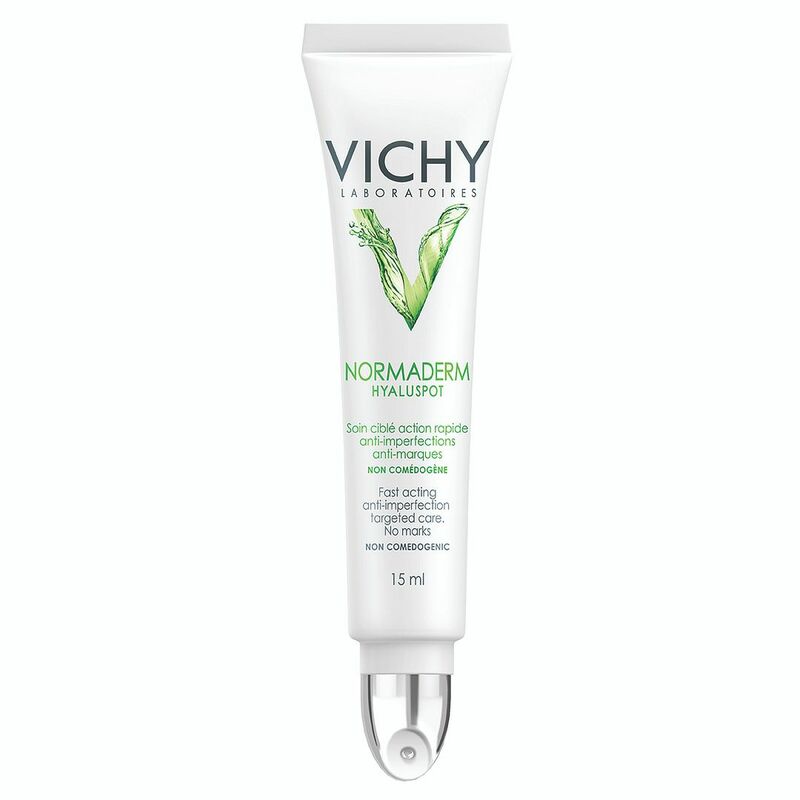 Vichy's latest product is the Hyaluspot Treatment (15ml, $29.90), a rapid action anti-bacterial bandage spot treatment gel to treat pimples. The Hyaluronic Acid content in the gel will form a protective layer on the pimple, while the Salicylic acid and LHA prevent further contamination and intensely purifying the skin from within, thus removing the pimple. The metal tip applicator is supposed to help cool your skin and also make application easier but I don't think it wise to contaminate the tip or content with the exposed skin /pimple. 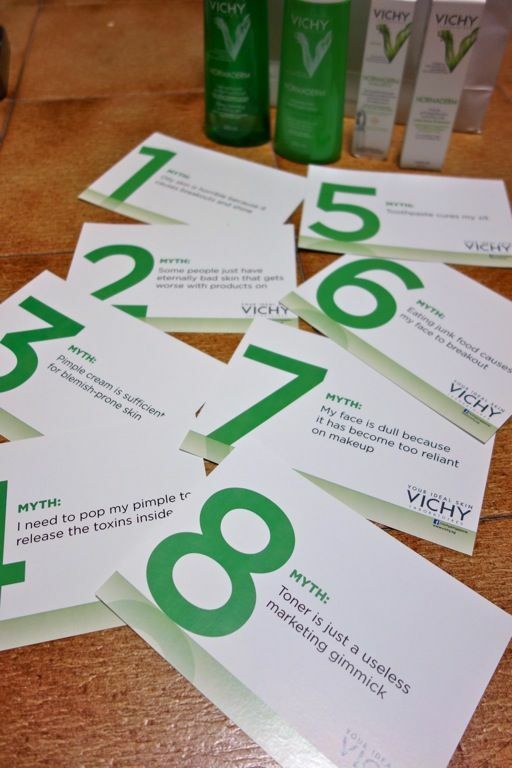 Vichy also threw in some myth-busting cards to provide more tidbits on attaining clear and beautiful skin. How thoughtful of them! I'll leave the reading to you guys. 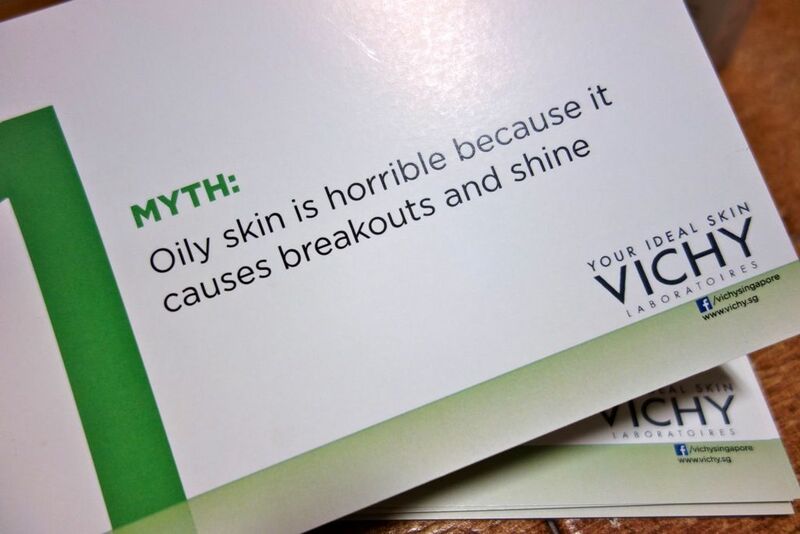 But some oil on your face is actually good (as highlighted by many of my doctor friends). It's better than a dry wrinkly face for sure! 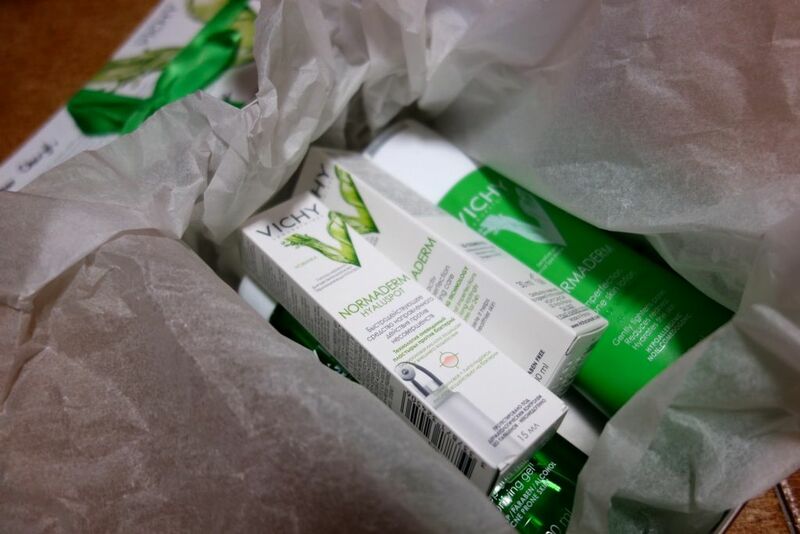 If you are not sure what products you should be using, you could do an online consultation on the Vichy website or head to the leading pharmacies for more details. Say hello to clear and smooth skin!